Whether Our Music Instructors teach contemporary, jazz, gospel, European classical, Latin or Caribbean, they are not only expert musicians – many with international careers – they are also dedicated coaches, who share their passion and skill with our students, encouraging them to hone their own creativity. Private music lessons begin in October and end in May with a recital. Registration begins the previous June, and continues through the school year if space is available in the teacher’s schedule. Group music lessons begin in October and end in May with a recital. Students are placed in groups according to age and ability. Registration begins the previous June and continues until January, if space is available in an appropriate group. 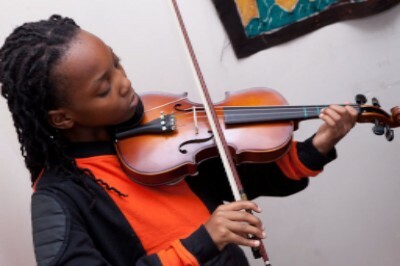 This is a special program for the most dedicated music students ages 11 to 18 who pass an audition, maintain a satisfactory level of attendance and home practice, and maintain a satisfactory academic level in school. Its objectives are to help students achieve high levels of technique and performance. The program includes full or partial scholarship for private music lessons, and additional music theory training. Calling all Mind-Builders! Wanna show off your skillz? Have your own spotlight? The Café Concert Series at Mind-Builders cafe is on again. Recite a poem, sing a song, perform a monologue, juggle, do card tricks, dance and more! The sky's the limit. Please fill out the form below to be considered. Let’s get our FAME on!